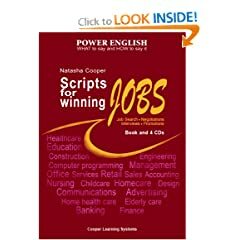 VARIOUS KINDS OF INFORMATION: Scripts for Winning Jobs. : Book and 4 CDs. Power English Series. Scripts for Winning Jobs. : Book and 4 CDs. Power English Series. If you've ever worried about exactly what to say at a job interview, this book and accompanying set of 4 CD's is just what you need. It walks you through a wide variety of job interviews, and helps you anticipate questions you will be asked, and will want to ask. And unlike other books on getting a job, this one even guides you through interviews with job recruiters, plus how to handle job evaluation and promotion interviews once you've got the job and want to keep it, or advance. Whether you are looking for that first entry-level job or a skilled position, this book has all kinds of appropriate things you can say about yourself, your training and experience. Drawing on actual job interviews, Ms. Cooper creates very realistic and appropriate language so that you can sail through job interviews with confidence, and get the job you want. She even helps you through the tricky salary negotiations with expressions that diplomatically get you into the salary range you want. This book is great for people who speak English as a second language, but is also extremely beneficial for native speakers going through the job search process. The CD's give an opportunity to listen and practice saying just the right thing on your next job interview.